Making great looking matrices, such as an Ansoff one, with the help of ConceptDraw DIAGRAM diagramming and drawing software is always much simpler and quicker as all ConceptDraw DIAGRAM users have an opportunity to download ConceptDraw STORE application in order to get the professionally looking result by editing the already previously created templates. The mentioned Ansoff Matrix is known to be a strategic planning tool used by the executives, marketers and senior managers in order to devise the strategies for achieving the future growth plans. It is named after Russian American Igor Ansoff, who came up with the concept. Harry Igor Ansoff was a Russian American business manager and applied mathematician, known as the father of the strategic management. After he came to California, he joined the University of California in Los Angeles in the Senior Executive Program. Being distinguished as a professor at United States International University for 17 years, he was involved in the strategic management research activities there. He was a member of the U.S. Naval Reserve during World War II, serving as a liaison with the Russian Navy as well as being an instructor in physics at the Naval Academy in the USA. He was well known all over the world for his research in such areas, as environmental turbulence, contingent strategic success paradigm (a concept which was validated by lots of different doctoral dissertations) and so-called “real-time strategic management”. 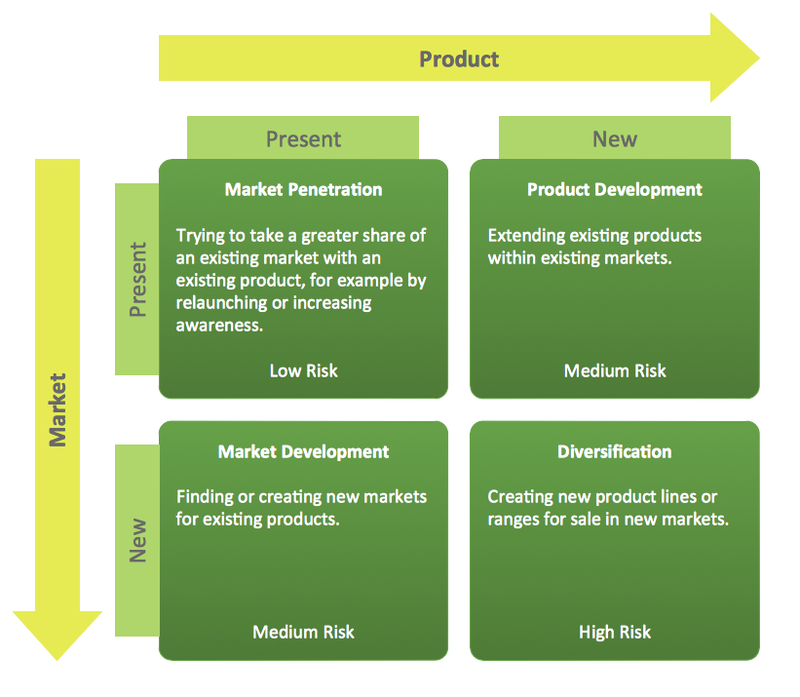 Lots of marketing as well as MBA students are known to be familiar with Ansoff’s Product-Market Growth Matrix, which is a tool he created in order to plot the generic strategies used for growing a business via new or already existing products, in new or already existing markets. Ansoff has consulted with hundreds of corporations, such as Philips, Gulf, General Electric, IBM, Westinghouse and Sterling Europa. In order to honour his body of work, there was established a prestigious Igor Ansoff Award in The Netherlands in 1981, given for management and research in the study of Management and Strategic Planning. There was also established an annual award by Japan Strategic Management Society as well as an Ansoff MBA scholarship by the Vanderbilt University. Being an applied mathematician, Ansoff shifted his emphasis in the 1950s while being employed by the Rand Corporation. Later, he was employed as a planning specialist by the Lockheed Aircraft Corporation in 1956 where he gained practical experience in analysing different complexities existing in a business environment. At Lockheed Aircraft Corporation he became Director of Diversification as well as Vice President of Planning. Harry Igor Ansoff served as Professor of Industrial Administration in the Graduate School at Carnegie Mellon University as well as other universities. In his 1957 paper, Harry Igor Ansoff provided a definition for a product-market strategy as being a joint statement of a product line as well as the corresponding set of missions that the products are designed. 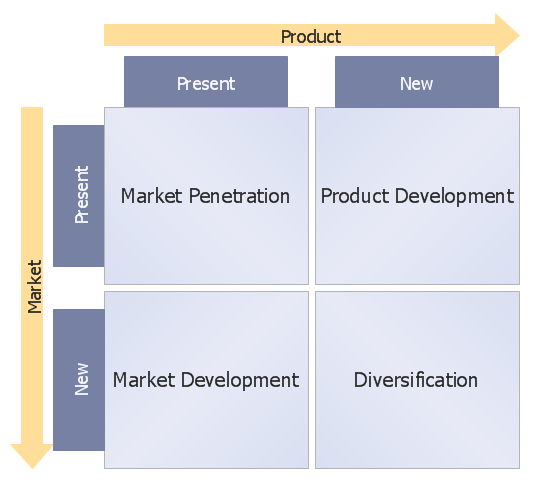 There are four growth alternatives Ansoff describes, which are: market development, market penetration, product development and diversification. By establishing a market development strategy, any company tries to expand into the new markets in a way of using its already existing offerings – products and services. The mentioned strategy can be accomplished in a way of getting the industrial buyers for products that were previously sold only to the households, to the new areas or to the new regions about of the country and by getting involved in the foreign markets. It is easier to succeed having such strategy in case the company has a unique product technology, which it can leverage into the new market, when it can benefit from the economies of scale in case it increases output, in case the new market is not too different from the previous one it has some experience in already, the buyers in the market are known to be intrinsically profitable. Having a product development strategy, any company tries to create the new products as well as new services which are all targeted at its existing markets for achieving the needed growth, involving extending the product range to this company's existing markets. The mentioned products may be obtained by the investment in research as well as development of the additional products or services, acquisition of rights for producing someone else's product, buying the product and later "branding" it meaning marketing it well, having the joint development with ownership of some other company which needs an access to this company's distribution brands or channels. The market penetration strategy can be used by the organization in order to grow by using its already existing offerings, such as services and products in the existing markets, trying to increase its market share in current market scenario. The mentioned activity is known to be involving the increasing market share within the existing market segments. What needs to be done can be achieved in a way of selling more services and products to the already established customers or in a way of finding the new customers within the existing markets. Thus, the company seeks the increased sales for its present products in the already present markets through more aggressive distribution as well as promotion. The mentioned goal can be accomplished by price decrease, an increase in distribution and promotion support, acquisition of a rival in the same market and modest product refinements. Creating the mentioned matrix should not be a problem as long as you have ConceptDraw DIAGRAM downloaded from this site as well as the Matrices Solution from ConceptDraw STORE — another ingenious product of CS Odessa with the aid of which you can make the needed drawings much quicker getting the smart and good looking result within only a few minutes and up to an hour. You need to draw Authority Matrix Diagram quick and easy? Design it with ConceptDraw DIAGRAM v12 ! ConceptDraw DIAGRAM v12 extended with Seven Management and Planning Tools solution from the Management Area is the best Authority Matrix Diagram Software. This sample shows the Perceptual map. It was created in ConceptDraw DIAGRAM v12 diagramming and vector drawing software using the Matrices Solution from the Marketing area of ConceptDraw Solution Park. Perception Mapping helps organizations measure and transform all aspects of their business, people and culture. Perception Mapping allows to represent the complex relationships graphically, helps identify potential problems of the organization and make the best decisions. 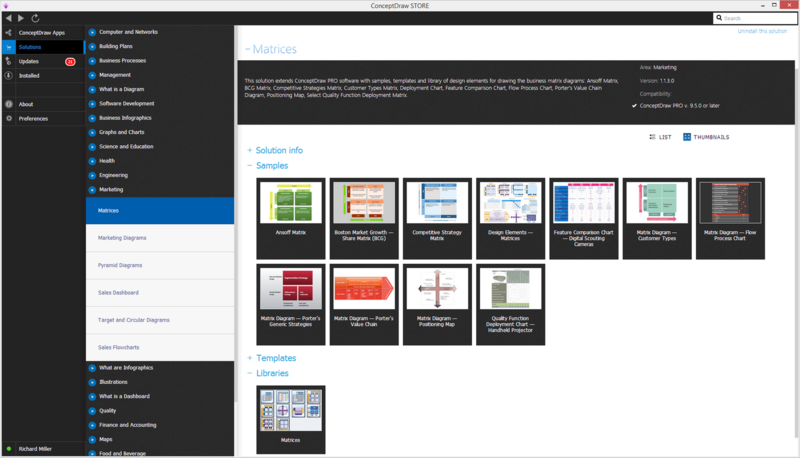 SWOT matrix templates is part of SWOT Analysis solution from ConceptDraw Solution Park.